Somalia’s South West State Police (file photo). The European Commission, the United Kingdom, and Germany have suspended its support for Somalia Police in the South West state under the Joint Policing Programme. The move follows concerns by the donors with the conduct of the police during the elections period in South West State. "Given the nature of these concerns, it is with regret we have taken the difficult decision to suspend our support to the police in South West State for the time being and have instructed UNOPS, as the JPP fund manager, accordingly," they said in a joint statement released on Tuesday. 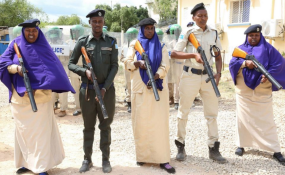 4.How to establish effective and clear procedures for the deployment of the Federal Police (Somalia Police Force) alongside and in support of the state police including. At least 13 people were killed in the Baidoa unrests that followed the arrest of regional preside tial contender and former Alshabaab number two Mukhtar Robow.